Designed for custom projects, the extruded polymer tip-out/spice tray is available in 36 that can be trimmed to the desired length. 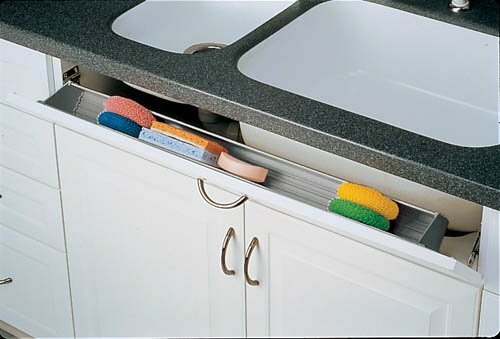 This versatile tray includes molded polymer end caps with key-shaped holes for easy removal and cleaning. Simply cut the tray to the desired size, attach the end caps with the adhesive provided and install on the false front panel. The included ETH hinge set is designed for wider false front panels and allows adjustable opening of 45 to 90 degrees.